This is such an easy recipe to throw together (and throw together is pretty much how I make it), as well as being healthy and one that we often make in our house. I first started making this as a simple mushroom risotto with sliced mushrooms and peas. It's quick and easy and apart from the mushrooms we often have all the ingredients available to hand. Now that we have kids we are always looking for ways of getting them to eat vegetables. Our now 2 year old was so good at eating just about anything, including my mushroom risotto, but like a lot of kids, has become more selective the older he's got. 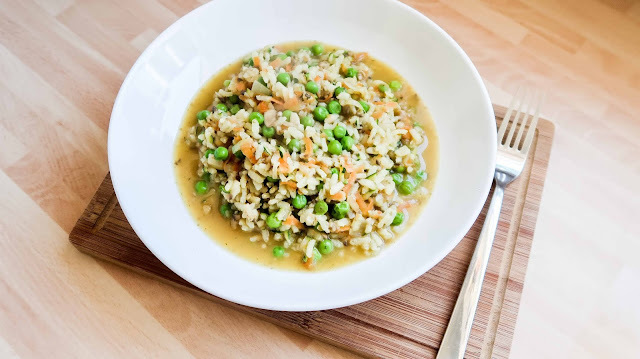 So I've changed the way I make the risotto so we can still keep it on our list of meals he'll eat that include vegetables (which isn't many). I have a rough recipe that I follow, so I will do my best to put it "on paper" for you. But once you have your basic risotto made you can add what vegetables or meat that you choose. If you're trying to make this without the butter you can use fry light. You can add as little or as much vegetables as you wish. It really depends on taste. Roasted vegetables also go really well with risotto. If you are choosing to add roasted vegetables, roast in the oven while cooking the rice. They will take around 30 mins in the oven. Melt the butter in a large pan, add the onions and saute until softened. Add the rice and mix well, coating each grain in oil. Add a ladle of hot stock to the rice and mix. Bring to a simmer as the liquid is absorbed by the rice. Continue adding more stock, a ladle at a time, letting the rice absorb it gradually. This process will take around 15-20 minutes, until the rice is soft. At this point I add the peas, mushrooms, grated courgette and carrot. Cook for a further 5-10 mins, until all the vegetables are cooked through.